School of Celtic Studies / Scoil an Léinn Cheiltigh catalog › Details for: An introduction to the Celtic languages. 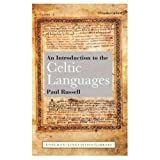 Details for: An introduction to the Celtic languages. An introduction to the Celtic languages. Published by : Longman, 1995 (London) Physical details: xvii, 347 p. 23 cm. ISBN:0582100828.